Kino Castle (鬼ノ城, kinojo) is an ancient mountain castle located in Okayama. It is also known as the model of Onigashima of Momotaro. Kino Castle is located on the top of Mt. Kinojo which is about 400m high. The entire top of mountain was surrounded with a great walls which is about 2.8km long. 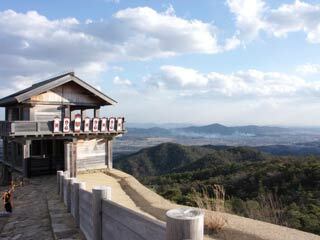 It was probably built in 7th century and considered as the castle of Ura clan which defeated by Kibitsuhiko no Mikoto. There is no public transportation. There is a parking and restroom. 1. use JR kibitsu Line to Hattori. 2. walk norht 1 hr. 20 min. There is no record mention about this castle. It was probably built after the battle of Hakusukinoe in 663 for the protection of the Chinese and Korean's invasion. The imperial court built 12 Korean style castles on west side of the capital. The castle was surrounded with huge mud walls which is about 2.8km long. There are four gates and 6 water gates. West Gate and walls are reconstructed as well as observatory which has great view of Okayam area. Today, it is popular hiking spots with beautiful natures and unique insects. It is one of 100 best Japanese castles. According to the legend of Okayama, Kino castle was the castle of Ura clan who is the Ogre from Kudara. Kibitsuhiko no Mikoto defeated Ura clan and sealed them under Kibitsu Shrine. This legend became the story of Momotaro. Therefore, Kino Castle is considered the model of Onigashima, the Island of Ogre. However, Ura is considered as the foreigners who brought the technology of making iron. The red color of Bloody river is actually the iron contents. There is the oldest iron mill on the east side of Kino Castle.